As many people in the Asperger’s Community understand, aspies often have trouble dealing with emotions. The emotional intelligence of a child’s mind is not much different from an aspie’s mind. Unfortunately, without useful tools, this emotional thinking carries into adulthood and can lead to poor decision making. If an adult aspie has a low EQ (Emotional Quotient), then impulse control, critical thinking, voice control, behavior self-modification, and problem solving fail to appropriately play their roles. In school, this means a bad reputation for the aspie with ramifications that make it worse for everybody. 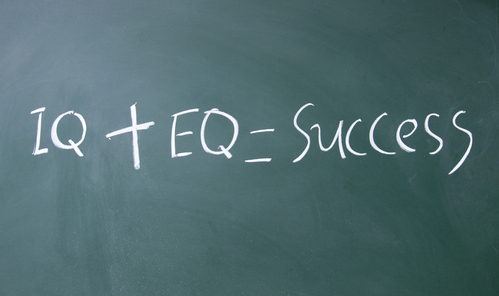 A low EQ could affect the relationship of the aspie student with the school faculty and also result in peer bullying. In the workplace, this usually means a write-up or an immediate layoff. At home, it means family tension. Indeed, negative emotions and behaviors are contagious. They always create toxic environments and habits in the aspie’s life. Ideally, everybody would like to get on top of this important issue in order to establish a solid foundation of peace. What sort of step-by-step process is necessary to do this? The answers vary depending on the aspie’s age, personal dilemmas, comorbidities, learning schema and environments, mentalities, and general life satisfaction. In adulthood, the amount of contributing factors significantly increases. The main reason for this is that many professional life aspects are added to personal life aspects. The good news is that even with a low EQ, aspies have a high IQ (Intelligence Quotient). Aspies can use their IQ to discipline their own minds and to break down each complex and difficult situation. This nine-step process encompasses how to foster an aspie’s Emotional Quotient (EQ), and can be used for non-aspies alike. The aspie has the ability break down abstract details of relationships and learning experiences through the use of their high intellect and concrete thinking. Eventually, they will constantly refine their thought processes to take responsibility and cultivate healthy habits. This strategy will allow the aspie to manage stress, cope with change, and embrace challenges that will increase the quality of their lifestyle. Thanks for much for this excellent article. I am an advocate for emotional intelligence skill enhancement coaching for young children and adolescents. This population is often overlooked. I am glad that you like this article. I definitely agree with your statement that this population is underrepresented in this topic. I may compose an eBook about emotions soon and publish that on the site.